Mom's Birthday Bag | Oh Sarah O ! I used Twisted Knitter's Noro Kureyon Felted Scraps Tote Bag pattern and 13 balls of Online Linie 231 Filz-Wolle in color #0205 to make the bag. Although I started the bag a month before my mom's birthday deadline, after tweaking the bag to mom's liking, I gave it to her over a month after the date. 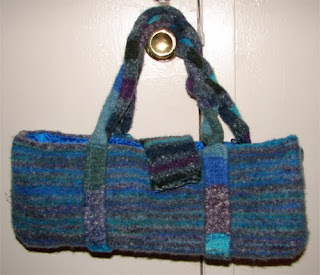 The bag was re-enforced with heavy duty interfacing and plastic canvas to maintain its shape and it was lined like Eunny Jang's felted bag with a zipper pocket (I also used this clever tutorial from Craftster). Unlike Eunny's bag, my mom wanted me to make felted bag handles as well. 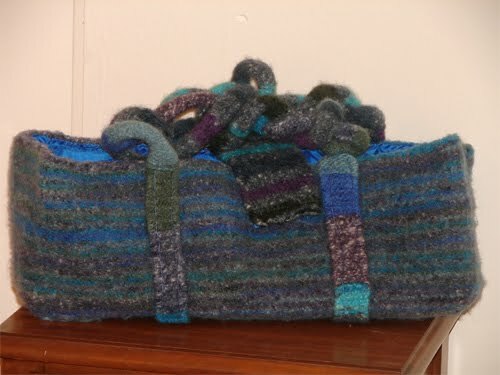 I did this by knitting 7 stitches into a strip long enough to wrap around the bag. 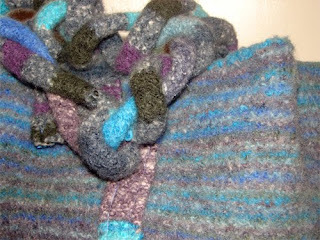 Then, I knit a 6 foot tall I-cord at the end of the strips. The strips were then hand stitched onto the bag BEFORE I added the lining (this was really rough on my fingers!) . Finally, I twisted the I-cords and mattress stitched the folded end to the other strip on the same side of the bag to make my handles. My mom was really pleased with her bag and enjoys showing it off to friends, family and her co-workers. What do you think? what a fun bag! i'm sure she loves telling everyone you made it!